One day the loss of fuel taxes will have to be addressed if electric cars are to become compulsory (after 2032 in Scotland, 2040 in England). Automatic pay-per-mile road tolls could be an option, probably still a long way off. 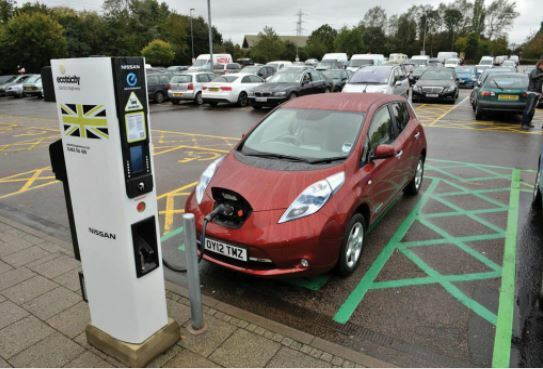 All electric vehicle (EV) charge points sold in the UK will have to be ‘smart’ and able to interact with the grid to help manage the increased demand for electricity expected to arrive alongside higher take-up, says Clean Energy News. The Department for Transport yesterday published its intended Automated and Electric Vehicles Bill, setting out broad stroke proposals for how the government will seek to increase the access and availability of charge points for electric cars. The document also confirmed powers to make it compulsory for motorway services and large petrol retailers to install charge points for electric cars, as well as ensuring access to live data of the location and availability of charge points. The plans to ensure all chargers are ‘smart’ will require each to offer a variety of measures around access and energy monitoring, as well as ‘to comply with requirements relating to security’ and ‘to be accessed remotely’. This could open the door for external parties like distribution network operators or National Grid to access and control charging to ensure peak demand levels do not exceed the tolerances of the grid. Northvolt today announced a partnership with the municipality of Skellefteå in northern Sweden for building Europe’s largest lithium-ion battery manufacturing. The factory will employ 2,000 to 2,500 persons. I and several others pointed this out quite some time ago – the government can’t live with out the fuel tax and using so called ‘smart meters’ is the only way they can recover that tax from electric car owners. There is another way but that requires the dumping of all subsidies and green taxes on fossil fuel power generation so allowing the cost to the consumer of electricity to drop dramatically as well as the government not requiring as much tax revenue to cover the subsidies. I wonder if the government ever thought through the tax questions surrounding the introduction of electric cars. Given the essentially moronic nature of most MPs and overpaid government pen pushers I suspect not. If people start buying electric cars en masses HM customs and excise will start losing a lot of money, they might then apply a tax to car chargers but how will they stop people from using electricity at home to charge their car thus defrauding the government of tax. Will they require car charging devices at home that cannot be jury rigged to steal electricity so that they can tax vehicular electricity use. If they put up electricity prices across the board then the poor who are unable to afford an electric car will be subsidising the rich, again. Did the idiot politicians we employ think this through before they decided in their infinite wisdom to subsidise electric car purchases. They’ve just opened the Mersey Gateway Bridge here in the north west. Tolls are taken by number plate recognition. Unless you set up an account you have to pay by midnight of the next day after crossing. So due to peak demand, your car won’t start charging until about 10/11 in the evening and stop charging at 6am. A bit tough if there are two of you, or more. You won’t be able to help guests out. What if you forget to plug it in? It’s going to be interesting what the 800,000 a year who run out of petrol will do when they need electricity, not to mention those who normally carry a can. Running out of juice is going to be the number 1 excuse for being late/missing work. They might as well cut straight to home working and miss out the electric car revolution altogether. If Scotland is to have compulsory EVs by 2032, watch people die in their hundreds in winter, not from ordinary fuel poverty – already a scourge there – but in their cars stuck on lonely roads in the Highlands. Did governments have to mandate how many petrol stations were built, and how the logistics of refuelling them would work when motor cars were introduced? Nope, the private sector just did what was needed. Back then politicians stuck to their knitting. I wonder how many more ‘borderline profitable’ service stations will be forced to close in rural community areas through this action. I have previously done calculations and commented on the implications of EV rollout for the very local (to me) distribution network. Briefly for 23 dwellings we need an upgrade to the cables and supply transformer which is going to cost circa £400K, this assumes not all cars will need charging every day and we are not going to need electric heating and can continue to use central heating oil or lpg. Smart chargers are not going to reduce this by 1p, everybody still needs to commute, shop, etc. The one house with 7 cars is going to have to be converted to a 3-phase supply. And how exactly are petrol stations and motorway services supposed to do all that? My local station here in London has 8 stands and so can fill eight cars at a time and that takes say ten minutes (on average) in total including paying, So each hour it can fill let’s say 50 cars. But each electric car will take hours to charge fully. For electric cars it can fill one car (assuming an eight hour charge and eight charging points) each hour. So to meet the same demand, they would need 50 times as many stations – in a built-up area with no space to expand. And where are the drivers supposed to go for eight hours? We will need to reinvent coaching stations all across the country where drivers can sleep whilst their cars recharge – just like stategcoaching but with a million or more extra people perhaps. Without a significant increase in range and a huge increase in charging speed, no-one will drive electric cars outside of cities and towns. It is simply utterly impracticable. Rapid charging is possible but may shorten battery life if used a lot. There are three main EV charging speeds. Rapid charging units (43, 50, or 120kW) can provide an 80% charge in around 30 minutes; Fast charging points (7-22kW) can fully recharge some models in 3-4 hours; Slow charging points (up to 3kW) are used for longer charging times, around 6-8 hours. The thing that is never mentioned with electric cars – where is the electricity coming from? It certainly won’t be from the unreliables and we don’t have the necessary coal fired generators available to take up the load. If, and it is a big if, the government expect electric cars to take over they need to have available a very cheap, reliable electric supply – something like we were told that nuclear power would supply electricity that was ‘too cheap to meter’. “Smart” is Newspeak for “stupid”. Remember that and all will be well. There is a very simple way to accomplish what they want to do using basic free market principles. It would require the grid operator to transmit down the grid the current price of electricity. That would vary according to current supply and demand. One might connect to a charging station and program it to provide 10 (units of local currency) worth of power to the vehicle. When power is abundant, maybe it is a windy day, they would get more power for their 10 ULC. Or they could tell it to “fill up” the battery but set a limit up to, say, 50 ULC. Or maybe they could tell it to unconditionally “completely charge the battery” but the grid operator might set a limit of 100 ULC. The point being that when a sudden surge of wind comes along, the price of power would drop. This price would be transmitted electronically through the grid and the “smart” chargers would note this change. It might check the price at 6 second intervals (10 times per minute). The result is more vehicles charging for longer periods when power is abundant so that demand for power can more closely follow the supply of it.